Welcome to the Cultural Synergies January 2009 newsletter. Happy New Year and welcome back to �The Cultural Synergist�. I hope it was a good break for you. We had a refreshing break at the office and are now back into the swing of things for 2009 and looking forward to the Year. I always take the opportunity at this time to reflect on the year that has been and the year ahead. There is no doubt that the last quarter of 2008 was a challenging one in a global economic sense and given the multitude of forecasts, will continue into 2009. As we interact with the media, it is easy to get caught up in the doom and gloom and focus on the problems of the world and the negative forecasts for the year ahead. Often I think it is somewhat challenging to avoid the prevailing pessimism that we are exposed to on a daily basis. How can it not have an impact on our psyche when we wake up to news headlines in newspapers and radio, constantly telling us about the latest economic woes. Often it is the first thing I hear when I wake up, then as I read the newspaper while eating breakfast the same stories and themes are driven home to me, so that by the time I walk out the door it is cemented in my mind. Often my mood has been unconsciously determined by the information that I have received within an hour of being awake! I think we need to remember to stop and appreciate what we do have and by this I don�t mean just in our professional lives, but also what we have within our family life, our well-being, our freedom and our achievements. When taking these moments it is also important to not only focus on our personal situations but to broaden our thinking and consider others less fortunate than ourselves. For example, think about the impact the global economic crisis is having on developing nations and their populations. Much of the global economic crisis has been focused around the industrialised countries and the emerging economies such as India and China, but spare a thought for the impact that a global recession will/is having on countries that rely heavily on aid and business from the industrialised countries. I was having a conversation with a friend at a barbecue recently and we were discussing that in this current climate �you can only do the best you can with what you have�. We concluded that acknowledgment, acceptance and appreciation for what we have in our lives at this moment makes for a positive outlook as we embark on a new year. 2009 may be a year of transitioning and riding out the current economic instability by just putting our heads down and getting on with things. As mentioned in the quote above, focus on �the now�. We are about to embark on the Chinese New Year. nbsp; This year the lunar year begins January 26th on the Western Calendar. This will be the Year of the Ox. 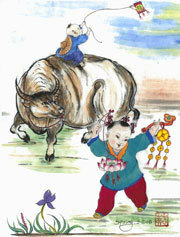 The Ox is the sign of prosperity that is achieved through fortitude and hard work. The Ox is a patient, hardworking animal. I think that some of the qualities of the ox are characteristics that are rather pertinent to what we might need to help get us through 2009, some of these being fortitude, realism and resilience. These characteristics will help us to be adaptable, flexible and open to new opportunities and developments, alongside cautious optimism. So let�s go forward into 2009 with what we have, make the most of those resources and opportunities and remember to take some time to reflect and appreciate what we do have and on a daily basis have an �attitude of gratitude�. Where In The World Is My Team? Making a Success of Your Virtual Global Workplace. By Terance Brake (2009). John Wiley & Sons. This book was released last month. Terence Brake is a well-respected thought leader and has written a number of books in working and managing across the globe. His model of the evolution of a domestic to a global company is a favourite of mine. His latest book is a departure of his other books. The first part of the book takes the reader on the journey of a fictional company, the reader journey�s through the book via the character of Will Williams and is exposed to his challenges of working in a global virtual workplace. I really enjoyed the whole concept of this book, the conversation between the characters, the humour and the drama of the plot makes it a refreshing, innovative change from reading the general outline of business books. Brake has some great strategies for global collaboration, which he refers to as the 6 C�s � co-operation, convergence, co-ordination, capability, communication and cultural intelligence. 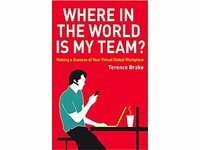 TMA World have launched an accompanying website www.whereintheworldismyteam.com which incorporates an innovative video in which Terry discusses the book and its content.